The use of health information technology (HIT), defined as the software used to store, retrieve, share, and use clinical information effectively, has been growing within the state of California. HIT tools have the potential to reduce errors and adverse clinical events, and to improve the quality and efficiency of patient care. Interest continues to grow among Californians in using technology to support their health care needs, with 60% saying they would like online access to their health information. Similar percentages want the ability to schedule appointments online, receive appointment reminders, and email their medical professionals. The third edition of Health Information Technology in California also shows that despite significant growth in the use of these tools among California’s physicians, hospitals, and health centers, the state lags behind the US in a number of areas, such as e-prescribing. A majority of California adults (77%) see an electronic health record (EHR) as a valuable tracking tool, and a greater percentage (85%) say doctors should have access to patient health information. Only 37% of Californians surveyed thought that their insurance company should have access to information in their EHR. Of the 57% of Californians who reported having access to their EHR, most used them to look at a lab test, schedule an appointment, or email a doctor. Thirty-one percent had no access to an EHR. Physician use of EHRs has increased steadily from 37% in 2008 to 59% in 2013. 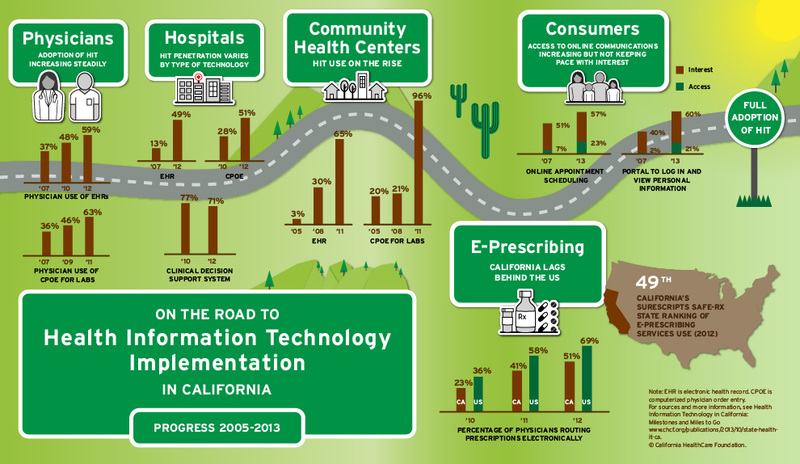 About half of California hospitals used EHRs in 2012, which is a significant increase from 13% in 2007. EHR availability among community health centers has grown tremendously. In 2005, 3% of health centers reported having an EHR. At the end of 2011, 65% did. Nationally, California ranked 49th on e-prescribing adoption and use. The complete report, all the charts found in the report, and a series of snapshots from 2008 and 2011, are available as Document Downloads.